If you have a well structured blog with links to right things at right places then your chances of getting more readers increases and that's what any blogger wants. This tutorial shows you how to add an good looking link to previous post at bottom of every post automatically. When you are new with all this HTML and CSS thing in blogger then you add a static thank you message at bottom of post one by one in all blog post while writing it, but there's more you can do with the template, you can add your own elements in the template to make your blog look better. Coming back to main topic of the post, it's about adding a link to previous post under each and every post automatically. Read further for the codes. Before you start, Backup your template. As usual we need the HTML to be in place and then we will add some CSS effect on it. The HTML code is actually just an anchor HTML with bloggers layout data tags to dynamically get the link of previous or older post. Copy the above HTML to your clipboard by selecting and clicking CTRL+C. We have to place it in the template and to do that follow these steps. 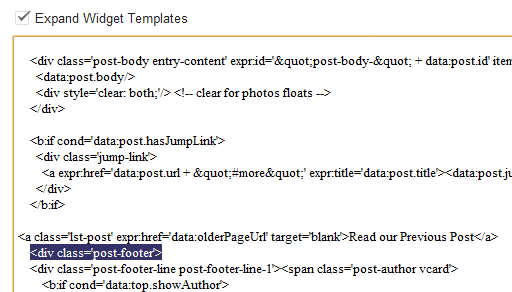 Once you find this line <div class='post-footer'> paste the HTML provided just above the code. When you have place the right code at right place then you can Save the Template. Now check one bottom of your one of post and you will see the link to previous post, but doesn't it look so dull ? It needs to be painted in CSS3 to attract reader's attention. The CSS code is lengthy but useful, all you have to do is now to add the CSS in your template to apply the style onto the link. Now paste the CSS in the custom CSS box, Preview it before you save to make sure it's working well. If it's okay, hit the Apply to Blog button refresh your blog with CTRL+F5 and see the link just below any of your post ! That's it ! This feature will keep your visitors engaged with your page and that's a good thing for your SEO and pageviews. Your readers will stay online for more time on your blog. You can help us make our blog post better by giving your suggestions and informing us about any error in post or the codes. Drop your precious comments which is very important for us. We will love to hear from you. Focus on SEO or the Content ? How to publish your content to a larger audience? Is your blogger blog owned by Google ? Buy a blogger template or use a free one ?